•She specializes in traditional and Jazz dance. •She was casted in 2007 in Beijing, China through SM‘s Casting System. •Her stress reliever is eating. •She is known for her incredible flexibly and often demonstrates it often on variety and reality shows. •She was the girl in SHINee‘s “Replay” MV. 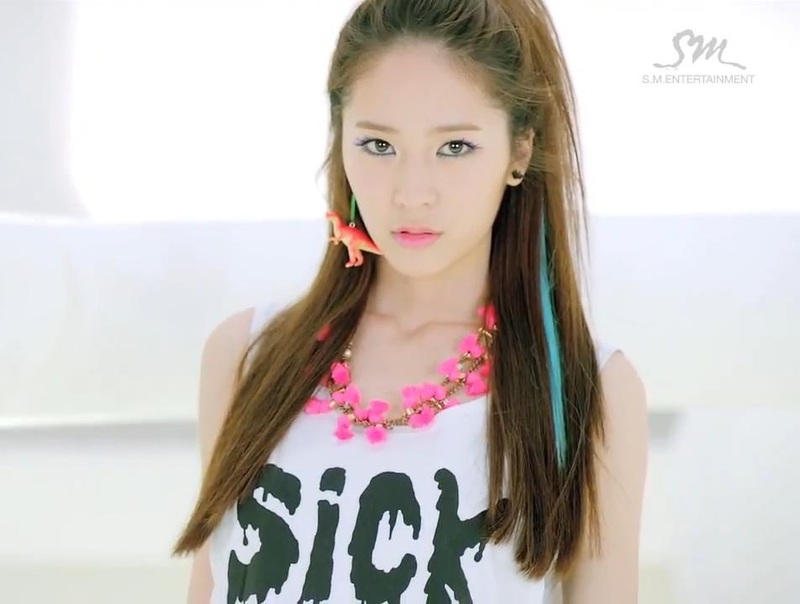 •She was in Super Junior‘s “U” MV. •She was in Kangta‘s “In My Heart Someday” and “Breaka Shaka”MV. •She was in TRAX‘s “Let You Go“ and “Blind” MV. •She was ‘married‘ to 2PM‘s Nichkhun for the reality show “We Got Married“ (In which Nichkhun said that he persistently asked the staff of WGM to be paired up with her pacifically). •Starred in the Taiwanese drama “Prince from a lost Castle/Love Broke Into The Door“. •Her idols are Faye Wong and Zhang Ziyi. •Her ideal guy is someone who is taller than her. •She is the mom of f(x) and is often the one who cooks for the other members. •If she had a super power, she would want the power to become invisible. •For her, the most perfect women in the world is Song Hye Gyo. •Idols she is close to are Kyuhyun of Super Junior, Zhou Mi and Henry of Super Junior M, Gyuri of KARA, and Tiffany of Girls Generation/SNSD. •She always brings tissues with her where ever shes goes. •She says the member that first stood out to her the most was Amber because of her boyish aura. •For 24 years she thought her O blood type was O and only recently realized her real blood type is A. •Her first kiss was with a guy she dated for two years before she went to college. •She was 10 when she joined the Beijing Dance Academy. •She tried tumbling while wearing heels for the first time while shooting the teaser video for “LA chA TA”. •Rain taught her how to do popping while filming for a commercial. •She is scared of injections. •In f(x)’s dorm she shares a room with Sulli. •It’s her dream to go to China with f(x) members to pursue an active career there as well. •She was selected from SM‘s global audition held in 2007. She sang MC. Max’s “Oh Heart, Please Stop Now” and K.Will’s “Left Heart”. •Is currently one of the main cast members in the reality show“Invincible Youth: Season 2“. •She was featured in Taiwanese singer Danson Tang’s single “I’m Back“. •She loves to play basketball. •She developed a love for rapping at a young age. •Her ideal type is a guy who looks cool but cute when he smiles. •She says the member that first stood out to her the most was Luna because of her voice. •In America, when she asked to use the bathroom sometimes the person would point to the men‘s bathroom. •Her favorite genre is R&B. •She is a big fan of rapper T/Tasha/Yoon Mi Rae. •She likes professional wrestler John Cena from the WWE. •She doesn‘t eat junk food anymore. •She can play the guitar and drums. •When she was younger she was a fan of Linkin Park and use to imitate rapper Mike Shinoda. •When she first heard KPOP, she began to listen to R&B artist such as Wheesung. •When she first came to South Korea to become a trainee, she felt like a complete stranger because the environment was completely different. She would ask herself “Why am I here?”, but member Krystal helped her out a lot since she also knows English and she gradually learned Korean more. •Her boyish image was something she wasn’t aware of because in the US she was considered normal. •There was a time during f(x) trainee days where Amber went shopping with Krystal and her fans said they thought she was her boyfriend. She was shocked. •A girl once confessed her love for her. •Her fans are called “Embers“. •When she first came to Korea she was constantly told that she looks like Super Junior‘s Donghae. She is now often told she looks like SHINee’s Jonghyun. The three of them sometimes take photos together and call themselves the “Dinosaur family”. •She has been on the basketball team ever since she was in elementary school. •Her dream is to create a stage where there are no restrictions. •She likes taekwondo so she practices her moves when she gets bored. •She has wanted to be a singer since she was 7 years old. •After f(x) first performance she was in a daze because it was so surreal that she had finally debuted. •Her favorite season is autumn. •She has participated in several drama OST‘s such as ”God of Study“, “Please Marry Me” and “Cinderella‘s Sister“. •She played “Elle Woods” in the musical “Legally Blonde“. •She played “April“ in the musical “Coyote Ugly“. •Was a host on MTV‘s “The Show” along with Secret‘s Hyosung. •She is best friends with solo singer IU. •Loves to eat pizza, but can‘t eat it as much as she wants to because of her diet. •Her role models are Lee Junhyung, BoA, Whitney Houston, and Brown Eyed Soul. •She has a twin sister and a brother. •She says the member that first stood out to her the most was Sulli of her innocent smile. •She feels that her voice is the weakest in her family. •She is good friends with the Wonder Girl‘s Lim since they went to the same school. •Her favorite song is Whitney Houston and Mariah Carey’s ”When You Believe”. •Her ideal type is someone who is dedicated to their work, loves music and knows how to value it, appearance like Japanese singer/actor Takuya Kimura’s fashion style, and has a job like her. •From a young age her alarm clock ring tone has been classical music. This is because her dad loves classical composer Chopin and would wake her and her siblings up every morning with Chopin music. •Her hobbies are watching Chinese movies to learn Chinese language and Chinese musical dance. •She prefers songs by Whitney Houston or Mariah Carey rather than songs with fast beats. •When f(x) started recording “LA chA TA”, Luna was told that she was the only one roaring too much. •Her must have item is a mirror. She can‘t live without. •She has been named “muscle idol/horse legs” because of her toned thigh muscles. •She is the tallest in f(x). •She was casted into SM in 2005 after her drama “The Ballad of SeoDongYo“. •She always carries her journal with her. •Her must have item is perfume. •She dislikes tight clothes and is more comfortable in a box t-shirt and hot pants with leggings under neath. •She debuted as a child actress and had acted in a lot of dramas and movies before debuting with f(x) such as Seo InYoung in the drama “Saving Mrs. Go Bong Shil“. •Was the voice of “Shelly“ in the Korean version of “Sammy’s Adventures: The Secret Passage“. •Was a co-host of Inkigayo in 2010-2011. •She has an older brother. •She dislikes her fingers. She wishes she could have long and thin fingers. •She is in charge of gags in f(x). •Her ideal type is someone who is responsible, caring, and mature. •Her fans are called Sullians. •Due to her friendly nature she befriended Super Junior‘s Heechul during their trainee days (He was a bit of an outcast at the time). •She is close to SHINee‘s Key. •In the f(x) dorm she shares a room with Victoria. •She and Krystal are the cooking princesses of their group. •She is friends with KARA’s JiYoung. They even made themselves nicknames: Egg White and Yolk. •Is the younger sister of Jessica of Girl‘s Generation/SNSD. •Her voice sounds more mature than her sister Jessica. •She believes that Jessica is prettier than her. •Was in Shinhwa‘s “Wedding March” MV. •Was in SHINee‘s “Juliette” MV. •Was in Rain‘s “Still Believe” MV. •Was in Alex‘s “Sweet Dreams” MV. •Was in the sitcom “High Kick: Season 3“. •Co-host of The M Wave music show along with MBLAQ’s Thunder. •She will pick someone who is uglier than her as a boyfriend because she doesn’t want her him to have a lot of girl fans and stalk him while they are dating. •She and Sulli are the cooking princesses of their group. •She loves hats and get‘s irritated when the hats she likes are itchy. •She likes mangos, beef, and Mexican burritos. •She would rather wear sneakers than heels. •She always has lotion in her bag. •She would rather have people call her by her Korean name, Soo Jung, over Krystal. •She is the only member who doesn’t stay in the dorm and lives with her parents. •She loves apples but is allergic to them. •She has a bear keychain with Harvard University written on it. •During an SM Town concert in LA, Krystal signed for all the fans at Sheraton Hotel until the security lady told her to stop.